The fact that this album has been out for a month and lurking on my devices for a couple is symbolic of the time required to transcribe the sound and effect into an alternative medium. There are so many positive attributes to Sons of Bill especially for those sauntering into Americana from an indie background. A jangle laden rock feast that instantly finds its groove and proceeds to only marginally detour underpins their hazy wistful sound. Think tones of late 80s Manchester on a West Coast tour and you start to move in the circles of this five-piece combo out of Charlottesville Virginia, containing three Wilson brothers who are literally ‘sons of Bill’. OH GOD MA’AM is their fifth full-length release since 2006, in addition to a handful of EPs. They made inroads in the UK on the back of their 2014 album LOVE & LOGIC and the show in Birmingham the following year made my top 20 list of favourite 2015 gigs. Therefore, any subsequent new material was eagerly awaited. The new record was released on Loose Music in the UK; a good fit for this type of band. It contains a neat round number of ten tracks deviating slightly in pace without losing any of the core appeal that rinses this type of music. Perhaps the lack of a top -drawer track made the identification process a little longer and thus coat hangers had to be constructed to split the forty-seven minute duration into bite size consumable chunks. Eventually, three tunes emerged to project the record further and away from the masses that occasionally submerge the listening process. The first of these is the tender atmospheric opener ‘Sweeter, Sadder, Farther Away’, which gently floats along inviting you grab it rather than forcefully imposing. Midway through the album, a more than decent melody brings ‘Easier’ to the fore, with Molly Parden (of Sam Outlaw association for folks in the UK) joining on vocals and getting full accreditation in the track listings. Just eclipsing these two for the ultimate golden moment is the memorable ‘Old & Gray’, successful in anchoring the closing stages of the record. Away from this trio, the other seven songs tend to hit on a familiar path and conglomerate into an entity. ‘Firebird ‘85’ and ‘Good Mourning (They Can’t Break You Now’) represent contrasting speeds, albeit within the similar domain of twangy guitars and hazy vocals. More up-to-date similarities to Sons of Bill come from the Co-Pilgrim/Dreaming Spires axis in the UK and Belle Adair, who had an album release earlier this year on Locke Records in Muscle Shoals Alabama. The general sound is highly suburban and one that finds its groove early on. You do need to tap into this zone to get the best out of Sons of Bill. Their style can be quite concealing and layers will need to be stripped away to hook up. One saleable trait of the record is that you do not need to be absolutely immersed into it. Casual play in the background or a car journey accompaniment can yield positive results. Sons of Bill will embark on a series of dates in the UK and Europe in August and on past evidence, these are likely to be memorable occasions. In the event of not being able to attend one of these shows, escaping from the pressures of the modern world with a copy of OH GOD, MA’AM is a desirable pursuit as long as you develop the right mind set. 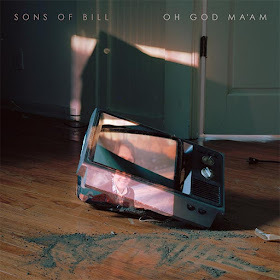 Tune in, and few bands are as good as Sons of Bill in executing a mood-driven sound of escapist melodic rock bridging the past, present and future.